I’m currently reading “The Plot” by Madeleine Bunting. It is the story of her father’s obsession with an acre of land adjoining the old Hambleton drovers’ road as it descends from the high moors to Oldstead and the Vale of York. Although I’ve passed by before, it is not an area I know that well. A trip out beckoned. 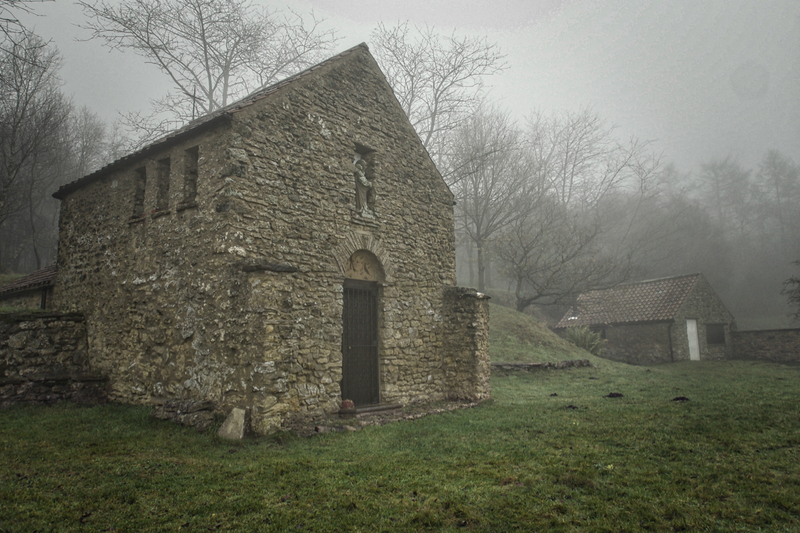 John Bunting first came across the derelict farmstead when he was a schoolboy at Ampleforth college in 1941. He found it again in 1956 and set about building a chapel from the old farmhouse in memorial to the ex-Ampleforth schoolboys who lost their lives in World War 2. The chapel is still privately owned but there are some open days each year. The name Scotch Corner is often confused for the other one at the junction of the A1(M) and A66. There are two theories. One is that the drovers that herded the cattle from the Scottish uplands to the cities of the south were, in the main, Scottish. Another is that it is a reference to the 1322 Battle of Old Byland in which the Scots, led by Robert the Bruce, trounced the English. It is believed the English, returning from an aborted invasion into Scotland, were camped at Shaw’s Gate on Oldstead Moor, a windswept spot less than a kilometre above Scotch Corner having marched south on the drovers’ road; King Edward II preferring the comforts of Rievaulx Abbey. The actual site of the battle is open to conjecture but what is known is that although the English had the advantage of high ground the Scots carried out a classic pincer attack and routed the English. Edward escaped by the skin of his teeth leaving behind his treasure, armour and privy seal. Today Oldstead Moor is unremarkable arable fields. No tourist information board marks the spot. In recent times the surrounding forestry to the Chapel has been clear-felled opening up the views to the south over the Vale of York. Apparently; but this morning the enveloping cloud presented an eerie atmosphere broken only by the four-wheel drive enthusiasts using the old drovers’ road, now a Byway Open to All Traffic. The bellowing of cattle replaced by petrol combustion engines. Thank you so much for these fascinating little pieces of our rich history. I intend to investigate as many as possible, please keep them coming perhaps a little nearer the coastal areas too! Looking at Scotch corner chapel, brings back memories of when l was a v. Ranger at Sutton Bank, I used to sit on that seat on the left of the chapel to fill in my report form before going back to the centre. Happy days.